Trans fat is considered to be the worst type of fat in our food supply. It’s pretty scary stuff that’s known to increase our risk of cardiovascular disease, the leading cause of death in both men and women in our country. 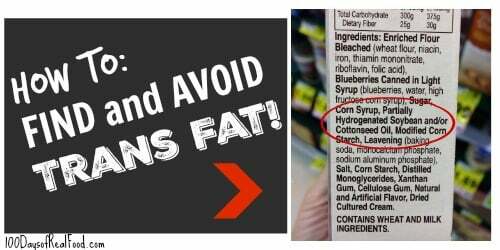 “Trans fat is created when hydrogen is added to vegetable oil (a process called hydrogenation) to make it more solid.” Food manufacturers do this because it’s less likely to spoil and, therefore, gives food a longer shelf life. Some restaurants even use partially hydrogenated vegetable oil in their deep fryers because it doesn’t have to be changed as often – yuck! And the worst part is that trans fat is TRICKY. A nutrition label can say it has no trans fat even if it’s not true. That’s because, “The Nutrition Facts label can state 0 grams of trans fat if the food product contains less than 0.5 grams of trans fat per serving.” This little fact comes straight from our government’s website. It’s important to know that if you eat several servings of foods that all contain 0.4 grams of trans fat per serving, it can obviously add up fast! Thanks, good ol’ government for approving that loophole for us! You won’t find “trans fat” on the ingredient label. That’s because our main source of trans fat comes from partially hydrogenated oil, so that is what you need to look for instead. Trans fat also occurs naturally in small amounts in meat and dairy products (and is present at very low levels in other edible oils), but this is not the main concern. It’s true, earlier this year our government finally admitted that trans fats are a threat to public health, and they have requested that the use of partially hydrogenated oils be reduced. BUT food companies have up to three years to comply, and even then they could petition the FDA to permit specific uses of these unhealthy oils. So, as far as I’m concerned, it’s up to us as the consumers to ensure we avoid trans fats! 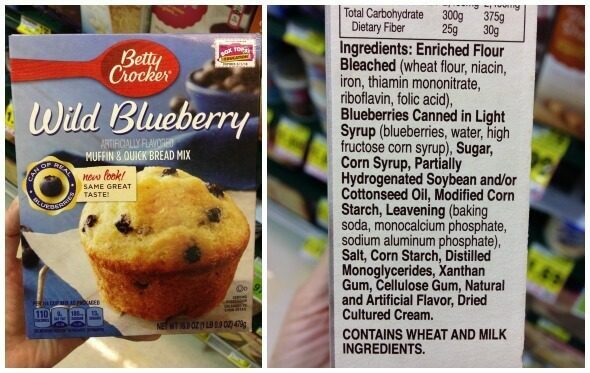 “Partially Hydrogenated Oil” on the ingredient label! 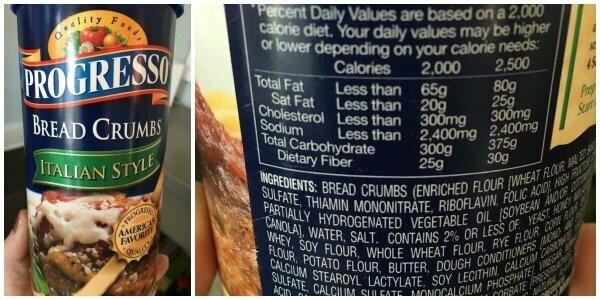 A simple, yet effective post, as I find that many people only look for the words “trans-fats” on ingredient lists. Thank you! Great information and great use of links to websites with information on why trans-fats are so harmful! Thank you for the post! Even though the government has acknowledged the issue of trans fats as a threat to public health and food companies must reduce trans fats in their products (over 3 years), one wonders what food manufacturers will come up with that will address the reasons for using trans fats in the first place, that is, to reduce spoilage and increase shelf life. Will trans fats be reduced or replaced with something else that may be just as harmful to public health, so that business can say, “We did our part.” ? Our responsibility is to continue to be vigilant and support companies that ethically put public health ahead of shelf life and the dollar. I appreciate the effort of companies like yours to educate us regarding nutritional issues and to guide us toward sound purchases. That is ‘our’ power. Thank you for posting this. You should read a book written by Dr. Fred Kummerow, a 101 year old biochemist who has dedicated his life’s work to exposing the dangers behind Trans Fats. The book is called “Cholesterol is Not the Culprit”. He’s brilliant and his book is, too. Great article. I talk with people all the time about the importance of reading labels. Obviously eating 1 ingredients foods in the best, but not always the easiest. 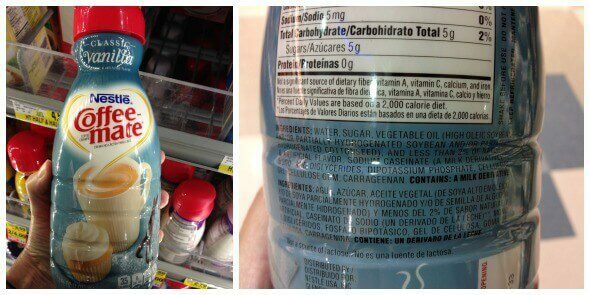 So, this is why it is so important to read labels. I also avoid High Fructose Corn Syrup and Food dyes. Thanks for always putting out good information. I am happy to share this with the people I work with. Your blog is always such a wake up call for me! Thanks for this much needed reminder to read our food labels!! Thanks for the post. I didn’t realize it was in so many products. Thank you, Lisa! This is great — well-researched, straightforward, clear advice. Much appreciated! Thanks Lisa! It is amazing how many foods still contain some form of trans fat. I felt so much better after cutting 90% or more from my diet. The new word is emulsified…ie: EMULSIFIED OILS, but it is the same process as partially hydrogenated oils. Rather than obsessing over all the ingredient lists, I’m finding it easier to not buy anything that has an ingredient list! I was surprised at how easy it has been to switch to real food. We are having great meals. It also seems that they fill us up more than the packaged food. Thank you so deeply, Lisa, for researching this form of an enemy to our digestive systems and bringing it to light! You are on the right track for more healthy bodies because of a lifestyle change in eating and cooking. What they are doing is Murder in the name of money. And it’s not just food but medicine, vitamins and supplements (the not pure natural ones), hair and skin products, soap, beer, and so much more. You have to do all your research on everything. There is even natural treatments and cures for cancer, diabetes, and many more which they don’t want you to know about. Our entire system has been hijacked by the rich, greedy, corrupt, and powerful. If we don’t stop fighting each other and fight the real enemy, we are doomed. I have a dairy allergy and am finding these things much harder to avoid, particularly when baking. Oddly, I can eat goat dairy but goat butter, when I can find it (wholefoods) is about $17.00 a pound! Anyone have cheaper sources? We use coconut oil often in our baking as a non-dairy alternative. Thank you, I’m looking forward to trying it. I enjoyed your post on hidden trans-fats. Is the same thing happening with high fructose corn syrup? Unfortunately, they are replacing partially hydrogenated oils with palm oil. 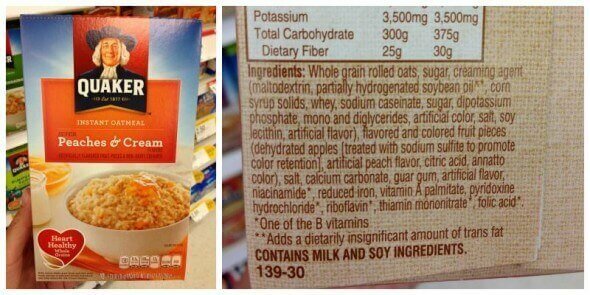 Read the labels of many Trader Joes products, palm oil is now put in everything. In response to this huge demand, massive palm farms are being clear cut into the only remaining habitat of orangutangs. The largest tree dwelling mamal will now be extinct within 10 years. Say NO to palm oil or say goodbye to orangutangs. nutrition but like you said they hide the trans fats in so many foods. Read labels!! The best thing you can do. I appreciate your blog so very much. Although we are pretty much “real food” eaters, we can always do better and gain more awareness. Bought your book and love it! Love the tips and the recipes! Thank you so much. Really very helpful information. I will take care of all the things you have told above. Thanks for sharing such a nice information. Thank you so much for the reminder. We use coffee creamer all the time, so I’ll have to watch out for that and see if it’s phased out yet. I wonder, though…how come they get 3 years to phase it out? I would give them no more than 3 weeks!!!!! this is SO helpful. THANK YOU for consistently tackling topics that really matter, in bite-sized, readable chunks! I’m trying to learn about all of the pitfalls to avoid, but sometimes I get SO overwhelmed to know where to begin! I’m wondering if you could put together a resource guide on where to start and how to progress on the journey to clean eating? I’m in a good place with my own diet, but I am at a loss on how to explain my eating choices to my husband who still loves to stop by the store on the way home from work and pick up items like frozen pizzas, microwave popcorn, soda, and every kind of packaged snack. Is there a concise, easy to read “clean eating for beginners” resource I could use to help explain these crucially necessary changes to my husband? Or to my curious friends? Hi. Have you checked out our Start Here page: https://www.100daysofrealfood.com/start-here/. There are a lot of resources there. Also, the challenge going on right now is a great way to start the journey: https://www.100daysofrealfood.com/2015/12/28/cut-out-processed-food-in-14-weeks/comment-page-4/#comment-641668. Haha – I don’t know about “without the guilt” part, but it is a better alternative these days. Happy baking! Oh thanks for that info, Reanna! I’ve been wondering about this myself. I made some sugar cookies over Christmas, with butter instead of the shortening called for by the recipe, to avoid the transfats. But apparently butter is not “stiff” enough, because the cookies spread badly in the oven, despite my having refrigerated the dough well before rolling and cutting out the shapes. I’ll check the Spectrum label and see if it’s something I can use next time. I have never made sugar cookies with shortening, only butter. Perhaps the butter was too warm? Or should the dough have been chilled before baking? I thought I’d read a while back that the gov’t had decided to require transfats to be eliminated. I was wondering when that would kick in, since I saw that my mom still has good old, transfat-filled Crisco in her house. But your post says the gov’t decided transfats should be “reduced.” (Instead of eliminated.) Would be helpful to have a link to see what’s actually being required. Anyway, I guess this shows us that it’s best to cook from scratch whenever you can. That way you control what sort of fats and other ingredients go into your food, and you can keep it real.